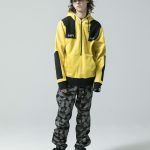 The BAPE Spring/Summer 2018 collection is full of colorful camo. The Japanese streetwear giant continues its love affair with camouflage print. 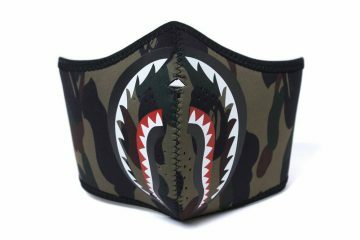 BAPE’s Spring/Summer 2018 women’s collection stays true to the brand’s trademark style. Its lookbook features everyday classics such as graphic tees, track pants, and printed hoodies. However, there are also contemporary, seasonal pieces. 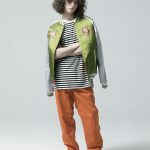 This includes a striped, oversized t-shirt dress, a turquoise sequin-back satin bomber jacket, a bright pink coach jacket, and retro, ’80s windbreaker style jacket. Another notable piece is the tie-dye t-shirt. It has graphic branding on the front. There is also a short-sleeve, camo-print button-up shirt with a neon orange mesh panel at the back. 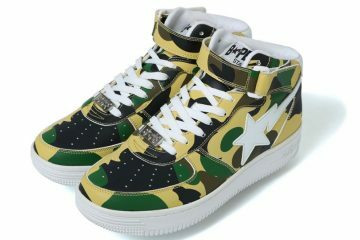 In the men’s collection, BAPE still showcases the classic camouflage print and its logo. Moreover, there are new versions of the Japanese label’s shark graphic as well. The collection will reportedly drop in the coming weeks. Stay tuned for updates.